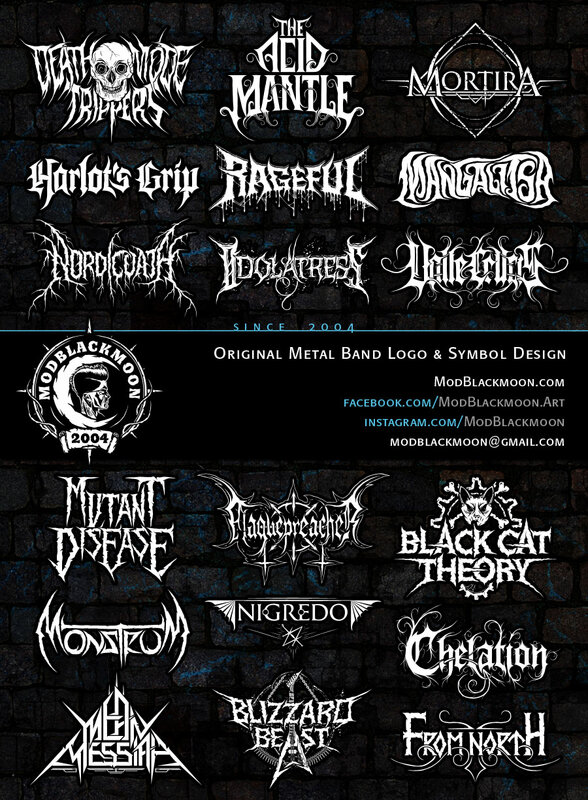 I'm a freelance Digital Artist, Metal Band Logo maker with over 15 years of experience in Lettering Design (started in 2004). I draw unique Rock and Metal Band Logos, Custom Emblems and Symbols for Artists, Personal Name Tattoos. I'm comfortable working with any edgy metalhead or gothic style, detailed, atmospheric moody design instead of 'neutral to please everybody'. You can also download some freeware Grunge and Metal Fonts designed by me. So, if you need an experienced Artist for any custom made Band Logo Art or Personal Name Design, I can create it for your Band or Project at an affordable price. Sometimes i accept free requests in exchange for promotion. Take a quick look at some selected artworks from my Portfolio. For more designs visit the gallery. My DaFont.com Profile - Total: 1,804,883 official downloads of my Fonts. All Logotypes are original and designed by hand from scratch, based on your description of the desired style. The final design is provided as professional printable vector AI, EPS and PSD files, as well as high-resolution raster PNG and JPG files.